Crafting in Yoohooville: Purple Flower Power! You guys will probably see a flurry of posts from me in the next couple days as I try to make stuff to sell at the Relay for Life. I know, I know, I got talked into another charitable thing. Again. With a tight deadline. Did I mention I know? Anyway, this was an idea for something quick and fun and I think they should be a big hit with the kids! Feel free to use them for your Relay for Life projects! 1. Slip knot (leave a nice bit of yarn free) and Chain 120. 5. Fasten off, and make sure to leave a nice bit of tail. 4. Chain 4, and do four treble crochets into the first double crochet from row 3. 5. Single crochet into the next stitch, then chain 3 (so essentially you will have a single crochet with three chains on top of it). 6. Repeat rows 4 and 5 through the entire circle. 7. When you reach the last set of treble crochets, you should be back at the beginning with no space for a single crochet. This is okay! Do the single crochet in the stitch where you had started the treble crochets (they should scoot over just fine). 8. Then join the first treble crochet and the last single crochet with a slip stitch. Fasten off, and weave in your ends. Your flower is complete! 1. Take your "chain" and fold it in half. Make sure it lies flat against itself! Take the pesky beginning yarn tail (from the beg. chain) and thread it through a yarn needle. 2. Weave this through the back of the flower, preferably into the first set of double crochets nearest the center ring. DON'T CUT THE YARN!!!!! 3. Once that's completed, do the same for the tail from the other side of the "chain". 4. Now, while I mentioned "don't cut the yarn", I really mean "don't cut the yarn!" here, also! 5. Now, take the remaining tails and thread them through the other side of the yarn, and weave them in. NOW, you can cut the yarn, LOL! If you're much more adept with a sewing needle, you could use some new yarn, but I'd just as same use the same thread from before. 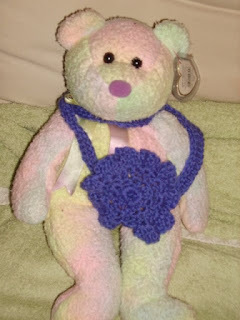 And there you have it, a cute little flower necklace, modeled here by my bear Groovy!